The Milwaukee Brewers visit Wrigley Field on Friday to play the Chicago Cubs. The probable starters are Chase Anderson for the Brewers and John Lackey for the Cubs. The opening line for this matchup has Milwaukee at +110 and Chicago at -120. The over/under was set at 8. The Brewers have a 68-71-7 over/under record and a 78-68-0 run line mark, meaning they cover 53% of the time. The Cubs are 77-68-0 against the run line and have a 65-73-7 over/under record. They cover the spread 53% of the time. The Brewers head into this matchup with a 65-81 record, including 26-45 on the road. Starting pitcher Chase Anderson has a 8-11 record with an earned run average of 4.53 and a WHIP of 1.37. He has 109 strikeouts over his 135 innings pitched and he has given up 138 hits so far this season. He has allowed 9.2 hits per 9 innings and he has a FIP of 5.06. The bullpen this year has an earned run average of 3.77 and they have given up 473 base hits on the year. Teams are hitting .250 against the bullpen while being struck out 437 times and walking 194 times this season. As a team, Milwaukee has allowed 9.05 hits per nine innings while striking out 7.38 batters per nine. They are 15th in the league in team earned run average at 4.13. The Brewers pitchers have collectively given up 1,298 base hits and 593 earned runs. They have allowed 164 home runs this season and they allow 1.1 homers per nine innings as a staff. Milwaukee as a pitching staff has walked 488 batters and struck out 1,059. They walk 3.4 men per 9 innings while striking out 7.4 per 9. They have a team WHIP of 1.38 and their FIP as a unit is 4.43. As a team, Milwaukee is batting .245, good for 26th in the league while putting together a .241 average away from home. The Brewers hold a .405 team slugging percentage and an on-base percentage of .325 which is good for 11th in baseball. They rank 28th in baseball with 8.03 hits per game. Ryan Braun comes into this game hitting .306 and his on-base percentage is at .371. He has 142 hits this season along with 74 runs scored and 82 runs batted in. He's struck out 88 times and has walked 46 times. Jonathan Villar is hitting .290 and he has an on-base percentage of .370. He has totaled 155 hits so far while scoring 81 runs and he's driven in 55. He has walked 68 times and has struck out 159 times. The Brewers have 1,173 hits, including 221 doubles and 171 home runs. They've stolen 161 bases while they've been thrown out stealing 49 times. Milwaukee has walked 555 times this season and they've struck out 1,382 times as a unit. They've left 982 men on base and have a team OPS of .731. They score 4.14 runs per contest and have scored a total of 605 runs so far this year. Chicago comes into this matchup with a 51-20 home record and a 93-52 overall mark. With an earned run average of 3.35, John Lackey has a 9-8 record and a 1.03 WHIP. He has 165 strikeouts over the 169.1 innings he's pitched during which he has given up 127 hits. He has allowed 6.8 hits per nine innings and his FIP stands at 3.72. So far this season the bullpen has an earned run average of 3.37 and they have given up 327 base hits on the year. Teams are hitting .208 against the Cubs bullpen while being struck out 456 times and walking 176 times this season. As a team, Chicago has allowed 6.83 hits per nine innings while striking out 8.82 batters per nine. They are 1st in the league in team earned run average at 3.04. The Cubs pitchers as a team have surrendered 997 base knocks and 447 earned runs so far this season. They have given up 147 home runs this year and they give up 1.1 home runs per nine innings as a staff. Chicago as a staff has walked 448 hitters and struck out 1,286. They give up a walk 3.1 times per 9 innings while they strike out 8.8 per 9. Their team WHIP is 1.10 while their FIP as a staff is 3.78. As a team, they are batting .254, good for 17th in the league while putting together a .249 average at home. The Cubs hold a .426 team slugging percentage and an on-base percentage of .341 which is good for 2nd in baseball. They rank 19th in baseball with 8.63 hits per contest. 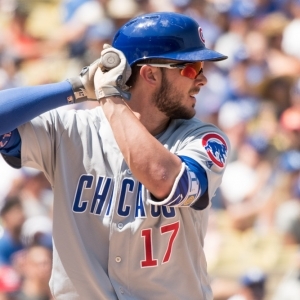 Kris Bryant comes into this matchup batting .296 and he has an OBP of .390. He has 163 hits this year along with 114 runs scored and 95 RBI. He's struck out 140 times and has walked on 69 occasions. Anthony Rizzo is hitting .290 and he has an OBP of .386. He has collected 154 hits so far while he's scored 88 runs and drove in 101. He has earned a walk 69 times and has punched out 96 times. The Cubs as a unit have 1,252 base hits, including 261 doubles and 180 homers. They have 57 stolen bases while they've been thrown out 31 times. Chicago as a team has walked 585 times this year and they have struck out 1,211 times. They've had 1,081 men left on base and have an OPS of .767. They score 4.98 runs per game and have totaled 722 runs so far this season.